A few weeks ago, Correspondences 2.1 appeared, featuring my article “Beyond the West: Towards a New Comparativism in the Study of Esotericism”. I focus on the role of comparative methods in the field of esotericism, a subject that has been fraught with controversy due to excessive misuses of such methods in the past. The core of my argument is that we need to lift the more general ban on comparativism that has largely been in effect, and start developing new and responsible ways of opening up the field to both cross-cultural and other sorts of comparative research. I analyse the scholarly background, the current situation, and offer concrete suggestions – including a typology of different sorts of comparative research that might be undertaken, and for what reasons. The reason for writing this post is not just to pique your interest in this article, however, but rather to point out that there is a broader discussion mounting at the moment. In religious studies generally, the debate is opened up again now with Jeffrey Kripal’s recent text book, Comparing Religions (Wiley, 2013), and in my article I cite a growing literature in esotericism studies that move in this direction. 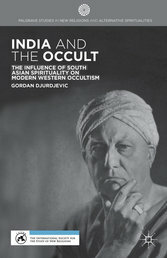 It was however nice to receive another addition in the mail last week, Gordan Djurdjevic’s India and the Occult: The Influence of South Asian Spirituality on Modern Western Occultism (Palgrave, 2014). Leafing through it this afternoon inspired this post, because I realize that Djurdjevic makes a sort of contribution that should have been included in my discussion had it been available half a year ago. So here are some quick thoughts, relating our comparativist projects. Occultism in a Global Perspective is a book of profound significance for anthropologists, despite the fact that none of its contributors are anthropologists. Indeed, other than the Comaroff’s work on “occult economies” (which does not take ‘the occult’ particularly seriously), anthropologists have paid fairly little attention to occultism, which is strange and unfortunate. These essays illustrate that occultism is a widely practiced congeries of ideas and rituals, and occultism clearly raises issues of syncretism, globalization, and the porosity if not inadequacy of standard categories like ‘religion.’ Hopefully this collection will inspire more research and theorizing on occultism, esotericism, and such modern forms of vernacular religion, psychology, and social change. Kennet Granholm and I made a parallel argument for our Contemporary Esotericism volume, which included a call to esotericism scholars taking anthropology more seriously. Read the whole review of Occultism in Global Perspective here. Following up the last post, here comes a report on the esotericism panels at the IAHR in Toronto, organized by Marco Pasi. As you can read about below, they go straight into a central debate in the field of esotericism studies at the moment.